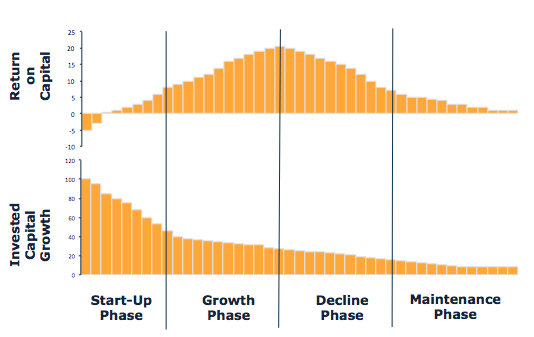 The methodology uses the concept of company life cycle by using a “fade”. The fade is separated into two phases: Phase 1 fade is over the next 5 years of the company; Phase 2 fade is from year 6 to year 40. In the default model, Phase 1 fade uses history to determine a straight-line fade. CFIRR and growth will fade according to volatility and level. If a company has a volatile history of CFIRR and capital growth, then the fade rate will be more pronounced. Likewise, if a company is at a high level of CFIRR and growth, then the fade rate will be more pronounced. In the default model, Phase 2 fade is an economic decay model, or reversion to the mean. On average, companies only earn an after-tax real rate of return on capital of 6% and grow their capital at the long term GDP rate. Therefore, in Phase 2 fade, all companies fade to 6% CFIRR and 2% growth in year 40. Analysts can override the default fades in both phases. In Phase 1, analysts take into account factors including the competitive landscape, current events and new trends to develop a forecast. In Phase 2, analysts take into account long-term sustainability such as brand strength and monopoly environments to develop a forecast. In most cases, overriding Phase 1 is enough to develop a good case for the value of a stock. ©2019 FSA Valuation Service. Do Not Copy.